Bonnie Mitten has been licensed under the Real Estate Act of British Columbia since 1978 and is licensed as a Sales Representative. During her tenure in the real estate profession Bonnie has been involved in many aspects of the real estate business including sales, training and teaching the salesman’s pre-licensing course to prospective new salespeople and of course her first love in the business, helping people to find and purchase the home and property of their dreams. 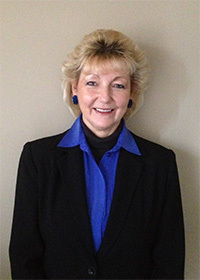 Bonnie brings to the Mitten Real Estate team a diversified knowledge, experience and expertise in helping her clients and customers with the acquisition and purchase of all types of real estate. Her areas of expertise include: pre-owned residential real estate; retirement living opportunities, new homes; lots and bare land; acreage, and hobby farms in the Fraser Valley area of British Columbia. Bonnie truly cares about her clients and is dedicated and committed to providing the highest caliber of quality professional service. This dedication to service coupled with her honesty, integrity and recognition that her job is to provide advice and expertise to assist clients and customers with their real estate needs and desires ensures that she truly goes that extra mile to assist clients and customers to accomplish their real estate goals. This commitment to client satisfaction ensures our clients receive the utmost in professional real estate service and has resulted in having won the loyalty of many customers who provide us with a high percentage of our business that is attributable to repeat and referral business. Our commitment to you is honest, caring, professional, competent service utilizing our comprehensive Buyer Assistance Programs and comprehensive Marketing Programs and our extensive market knowledge, our experience and skill at negotiating, to successfully assist you to achieve your real estate goals in the most pleasant circumstances possible. Regardless of whether you are interested in buying or selling a home, acreage or a retirement living opportunity in British Columbia's Fraser Valley communities or simply require some advise and counsel pertaining to real estate, our extensive experience and expertise as well as comprehensive information about the market and the process will assist you to make the right decisions and will ensure we help you to accomplish your real estate goals. This commitment to client satisfaction ensures clients receive the utmost in professional real estate service and has resulted in many loyal customers providing us with a high percentage of our business that is attributable to repeat and referral business. If you know of someone who requires Real Estate assistance please be sure to have them contact us.